With nearly 150 days into the 115th Congress, Member Offices are still witnessing record-breaking levels of civic engagement. In addition to more phone calls and physical mail, every office has experienced vastly increased volumes of inbound email. It’s been a challenge for staffers to keep up with the volume, but it has also been a challenge for Congressional technology providers, too. The technology and support teams at Fireside21 realized quickly that this spike wasn’t going to be a small blip, but rather the new normal for Congressional correspondence. We immediately went to work making optimizing performance to increase the speed of data moving through the system. So, just how much has the volume of incoming mail increased? In short, around 3x as much. In the first three months of this year, Fireside21 processed a total of 2,221,227 inbound emails for CRM users. 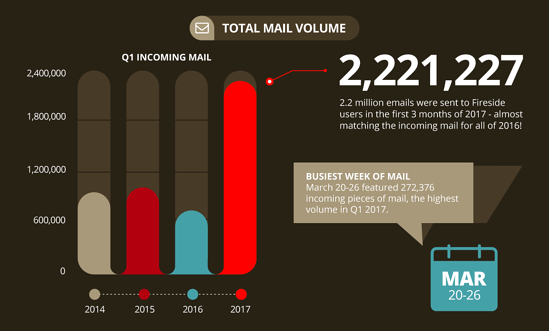 For context, that is almost 3x more inbound email and nearly half a million more than we received in the first quarter of 2015 and 2016 combined. That’s a lot of email! The pace of email has been pretty consistent in the first quarter of 2017, too. The busiest week this year was March 20-26, when offices received a total of 272,376 inbound pieces of mail - more than all of March 2016. On average, this year’s slowest week leaves last year’s slowest mail week in the dust, increasing more than 12x across all Fireside users. 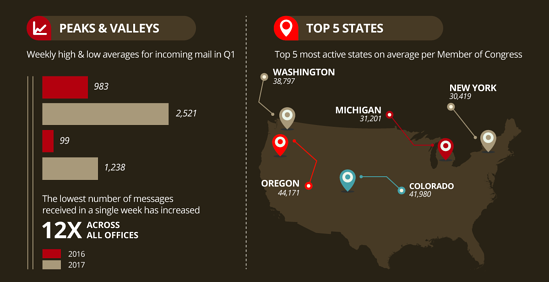 While inbound mail activity has been fairly balanced on average across all states, Oregon and Colorado led the way sending more than 40,000 emails per Member to their elected representatives. As exciting as it is to witness democracy in action and constituents interacting with their elected representatives, it can understandably be a bit overwhelming for Congressional staffers to be slammed by the sudden (and historic) increase in mail. There are two ways that Fireside21 has worked to make life easier on our users. Whether it's individual messages, massive advocacy campaigns or even digitized paper letters, sorting and logging the mail in your Inbox requires a tremendous amount of time. Last fall, we deployed Inbox Automations - routing rules that can be created on the fly to automatically log and assign inbound mail. In the future, those messages will always skip the inbox and go directly to the appropriate staff member. With 3x the volume of mail coming in, Inbox Automations have never been more important. Since the beginning of 2017, the amount of mail being automatically logged, sorted and assigned has increased from 20% to 35% among all Fireside CRM users. 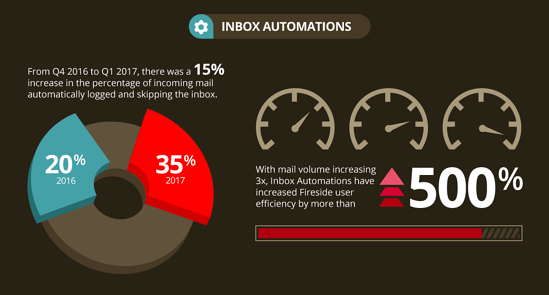 Combined with the surge in volume, Inbox Automations have helped staffers dramatically increase their effectiveness with the average Fireside user efficiency increasing by 525%. Individually, Member offices have been able to automatically log and assign as much as 80% of their incoming mail during the first quarter of 2017. Read more about Fireside Inbox Automations here and here. In addition to providing time-saving tools, we also re-evaluated system performance. After two weeks of unprecedented levels of mail coming into our servers, we realized this was the new normal. These levels were not just occasional spikes, and our mission is to always provide the best performance, so a new normal would require a new vision. In addition to provisioning increased server resources, our developers also optimized the sending engine to process and deliver Newsletters faster than ever before. How much better did we do? Individual Newsletter sends will vary based on size and number of simultaneous sends, but the average new send speed is .08 seconds per recipient! Who knows how much the volume will change as more and more citizens embrace their first amendment freedoms and engage first-hand with democracy? Everyone at Fireside21 will continue creating ways to deliver the best performance on the Hill. Innovation is in our DNA - simpler, faster, better.